Because we can't stop, won't stop with the Bookerdemonium, New York magazine brings us some more reasons why we'd love to cuddle up to Mayor Handsome. (And there are, alas, reasons why we really wouldn't.) Either way, there's no denying that the man is a political star; every person with a Twitter account wants to be him, do him, or just give him a hug and tell him to take a nap. Speaking of sleep, Booker apparently catches his z's in 20 minute fits and spurts, and not just because he's probably loaning his bed out to displaced persons. After his super campaigning for Obama and Hurricane Sandy, the past couple of months have been merciless. Even heroes have the right to dream. As far as using his bed for other things (ew sorry), Booker is keeping quiet. Of course, his mom, who presumably would like some mini-bookers to bounce on her grandma-knees, bothers him about it. Mom, GOD! 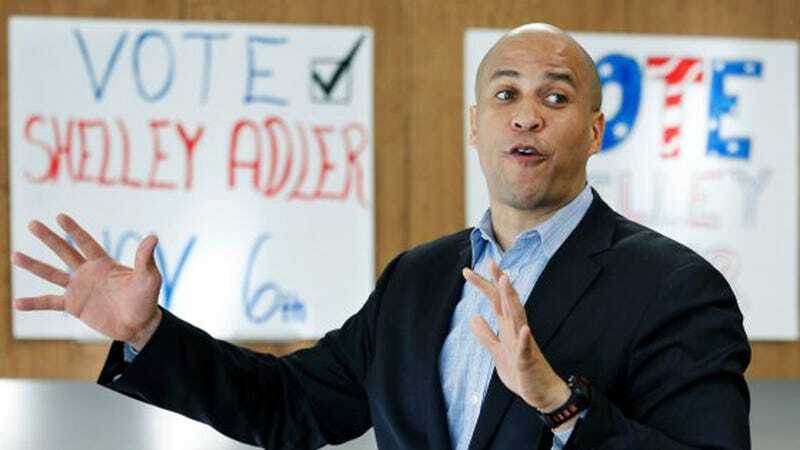 Booker, 43, won't directly comment on his romantic status, but says: "Let's just put it this way, my mom, who has gone through phases in my life about what she bugs me about, now her quest is to see her son in blissful matrimony. And I'm nowhere near that, but it would be a wonderful thing to experience. And this job does make it very hard to get to that end. I definitely have frustrated exes out there." A Romney victory would've just made him "bummed," but watching Steel Magnolias or Beaches would be a whole other story. "I come from a mother who can cry at a G.E. commercial," he says. "So, you know, my family, it wasn't a bad thing." Now that things are coming down for him, Booker's focusing on the future. "The joke I always make is I'm either running for reelection, running for Senate, running for governor, or running for my life. The latter is also a viable possibility." It looks like Clinton/Booker in 2016 might actually be a possibility, huh?